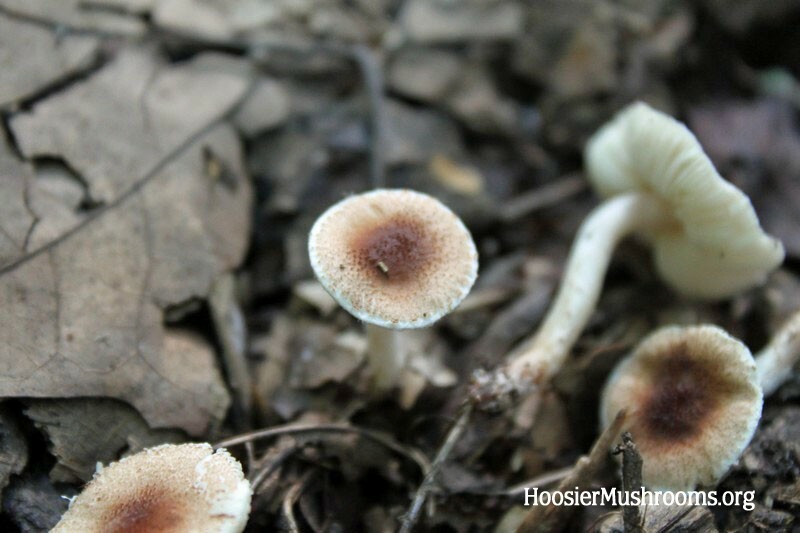 This is another very small Lepiota that is can be found in the woods, and is usually hard to identify. It generally has a brownish center to the cap that is made up of brown scales, as opposed to a solid and smooth disc in the middle. The cap should not be wider than 1 inch, and the stem shoudl not be much longer than 2 inches. The lower portion of the of the stalk also tends to have brown fibers. Certain identification to species may require a microscope, but if you are sure it is a Lepiota, and it has the above characters, this would be a good place to put it. This is a deadly poisonous mushroom. Lepiota cristata is very similar to this mushroom, although it has a lighter pinkish red color to the cap. The central disc should have a solid, smooth layer of red with L. cristata. Lepiota clypeolaria has a of a shaggy stalk. Lepiota rubrotincta is also similar, but is larger and usually has a lighter red color.